National Teacher Day and Teacher Gift Sets! Description: Looking for the perfect teacher gift? Get a gold star with this gift set! 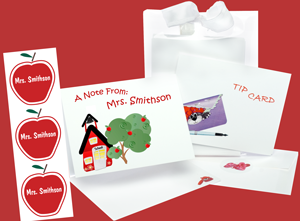 Personalized note cards and adorable Apple-shaped Labels make the perfect thank-you gift! (perfect for labeling classroom supplies). We use high quality graphics to create our cards and all are printed on Acid Free heavy card stock. Presented in a beautiful clear cello bag and pretty ribbon, it makes a perfect gift. They are so cute and any teacher would love to get such a cute personalized gift! Lovable Labels has some pretty awesome products just head on over to www.lovablelabels.ca and check out all of their great items.